As for other specifications, it is powered by a quad-core Intel ‘Cherrytrail’ Atom x5-Z8500 processor clocked at 1.44GHz, with a Burst frequency of 2.24GHz. This class of Intel processor requires no fan, enabling a design that is as compact as possible.The Kangaroo also includes 2GB of LPDDR3 RAM and 32GB of eMMC storage, and it can be expanded by as much as 128GB at a time thanks to microSDXC support. There’s a battery inside too, which the company claims, can keep the device ticking for four hours under “casual use”, and the portable PC also bears a Micro-USB port for charging. On the software front, the Kangaroo runs Windows 10. The mini-PC features Wi-Fi 802.11ac and Bluetooth 4.0 wireless connectivity. The InFocus Kangaroo is priced at $99 (roughly Rs. 6,500) and is available for purchase starting today in the United States from online retailer Newegg.com. The company says that it will begin to sell the pocket computer at Microsoft Store starting mid-November. 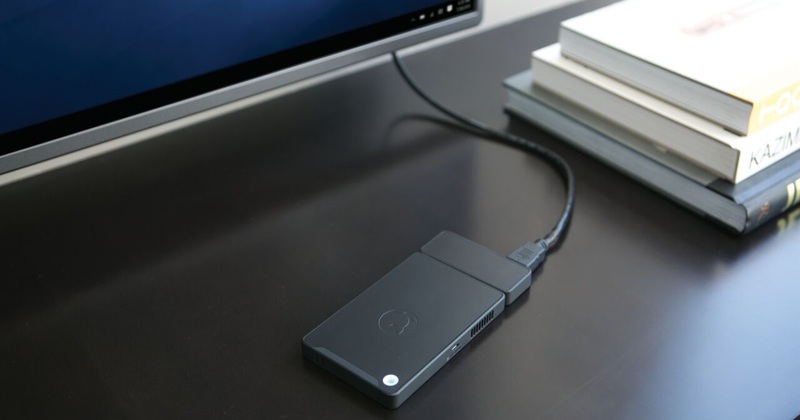 There is currently no widely used name for this class of device because it’s among the first of its kind — a truly portable computer that can connect to nearly any screen around you and instantly transform it into a desktop PC. Perhaps we can think of it as the ultrabook of desktop computing. But don’t expect it to handle your high-end chores such as graphics intensive games. You should be able to do web browsing, play casual games, and watch full-HD video files without a lag, however.